The Dwyer Series 629 Differential Pressure Transmitter monitors differential pressure of air and compatible gases and liquids with 0.5% accuracy. The design employs dual pressure sensors converting pressure changes into a standard 4-20 mA output signal for two wire circuits. Small internal volume and minimum moving parts result in exceptional response and reliability. Terminal block zero and span adjustments are easily accessed under the top cover. The Series 629 Differential Pressure Transmitter is designed to meet NEMA 4X (IP66) construction. Wetted Materials: Type 316, 316L SS. Accuracy: ±0.5% F.S. (includes linearity, hysteresis, and repeatability). Compensated Temperature Limits: 0 to 175°F (-18 to 79°C). Thermal Effect: ±0.02% FS/°F (0.036%/°C). Power Requirements: 13 to 35 VDC (2-wire). Zero and Span Adjustments: Accessible potentiometers. Loop Resistance: DC: 0-1300 ohms maximum. Electrical Connections: Terminal block; 1/2" female NPT conduit. Weight: 10.1 oz (286 g). NOTE: Pressures exceeding the working pressure limit may cause a calibration shift of up to ±3% of full scale. 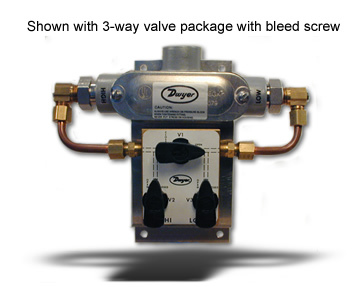 -3V 3 Way Valve Package for Chillers. -LED 4.5 Digit LED Display. A-228 - Stainless steel flex hose, 12" (30.48 cm) long, 1/8" male NPT connections. A-229 - Stainless steel flex hose, 18" (45.72 cm) long, 1/8" male NPT connections. A-332 - Brass adapter, 1/8" female NPT to 1/4" male NPT. 629-04-CH-P2-E5-S1-3V Wet/wet differential pressure transmitter with 3-way valve package, range 50 psid, working pressure 100 psid, over pressure 250 psi. 629-05-CH-P2-E5-S1-3V Wet/wet differential pressure transmitter with 3-way valve package, range 100 psid, working pressure 200 psid, over pressure 500 psi.